Beautiful rug but was not what I expected. Thought it was a heavy wool rug but turned out to be thin. Great quality and price. Wish it had worked but had to be returned. The Samarkand hand-woven rug is made from 100-percent wool. 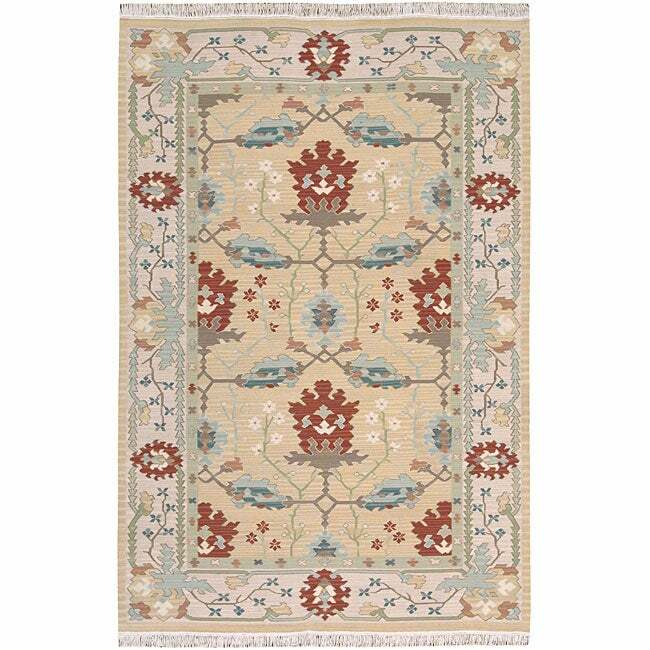 The reversible design of this rug is inspired by a dramatic range of European and Persian motifs with bold accents of blue, red, aqua, and grey. 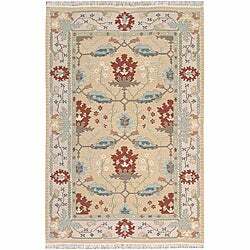 This rug offers great value, especially at Overstock's price. The weave is tight & well-woven, and the fact that it's wool makes it durable. Colors are predominantly a golden wheat plus rust red, spruce blue, teal, cream, and a little green. Don't hesitate to buy it! The colors in this rug are perfect for my room as well as the size. It arrived in good condition and I was very pleased with the savings for this size rug.